UML use case diagram example for Hospital Management. Hospital Management System is a large system including several subsystems or modules providing variety of functions. 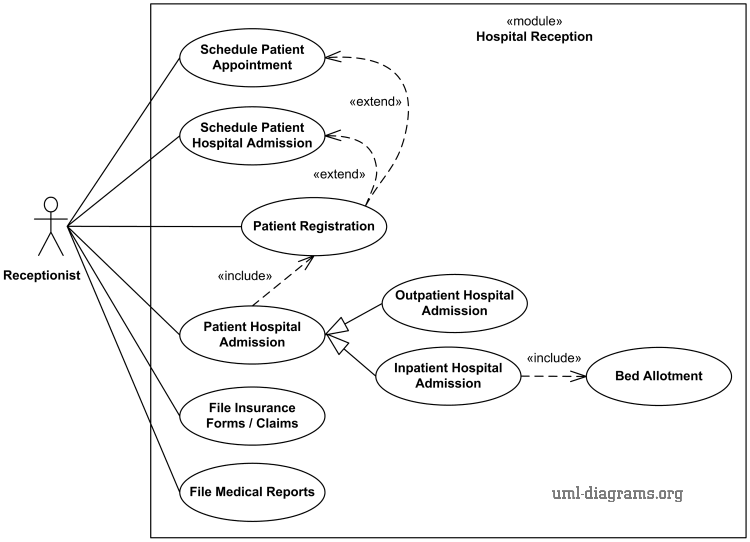 UML use case diagram example below shows actor and use cases for a hospital's reception. Purpose: Describe major services (functionality) provided by a hospital's reception. Hospital Reception subsystem or module supports some of the many job duties of hospital receptionist. Receptionist schedules patient's appointments and admission to the hospital, collects information from patient upon patient's arrival and/or by phone. For the patient that will stay in the hospital ("inpatient") she or he should have a bed allotted in a ward. Receptionists might also receive patient's payments, record them in a database and provide receipts, file insurance claims and medical reports. An example of use case diagram for Hospital Reception.